Pedro Pablo Oliva graduated from the Provincial School of Visual Arts in Pinar del Río in 1961, and the National School of Art in Havana in 1970. He is a member of the National Union of Cuban Writers and Artists (UNEAC) and the UNESCO International Association of Art (IAA). Oliva is also a consulting professor at the Superior Institute of Art in Havana. His most relevant solo exhibitions include Unfulfilled Promises at Pan American Art Projects in Miami, 2008; Historia de Amor (Love Story) at the National Museum of Fine Arts in Havana, 2007; Papeles Nocturnos (Evening Papers) at Domingo Padrón Gallery in Miami, Florida, 2002; Quiero pintar en paz (I Want to Paint in Peace), a retrospective exhibition at La Acacia Gallery in Havana, 2000; El Gran Apagón (The Great Blackout) at the Center for Visual Arts in Pinar del Río, 1994; and Pinturas, dibujos, bocetos y pasatiempos (Paintings, Drawings, Sketches and Hobbies) at the National Museum of Fine Arts in Havana, 1984. His works are part of the collections of the National Museum of Fine Arts in Havana; the National Museum of Ceramics in Havana; the Bacardi Museum in Santiago de Cuba; the Museum of Art in Pinar del Río; the BANCOLAT Collection in Panama; and the Museum of Contemporary Art in Monterrey, Mexico, among others. In 2006 he received the National Visual Arts Award, granted by the Cuban Ministry of Culture, for his lifetime achievements. 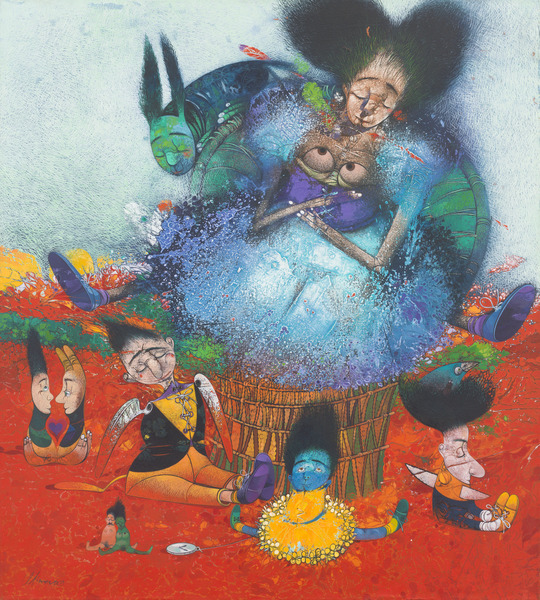 Los dulces muñecos de Azul (The Sweet Dolls of Azul), 2003. Oil on canvas. 46 x 41 1/2 in. El artista y su modelo (The Artist and His Model), 1999. Oil on canvas. 90 1/2 x 70 x 1 in. Las Amigas (The Friends), 2009. Color pencil, graphite, watercolor and collage of paper on board. 66 1/2 x 38 7/8 in.